If you don’t snooze, you lose. Having untreated sleep apnea increases your risk of heart attack and stroke by at least 30 percent. The chances are even greater if you’ve already suffered a heart attack or stroke. Sleep is a basic human need that impacts all aspects of health. When sleep is lacking or disrupted, various critical body functions are negatively affected. This is especially dangerous for older adults who may be more susceptible to developing new or worsening serious health issues. In fact, the prevalence of disturbed sleep increases as individuals age. According to the National Sleep Foundation, 44 percent of seniors experience disturbed sleep at least a few nights each week. Dr. Berta Bergia, one of two board-certified sleep specialists at Parkwest’s Sleep Disorders Center, says the two most common sleep problems she sees in senior patients are obstructive sleep apnea and insomnia, both of which can be deadly if untreated. Obstructive sleep apnea (OSA) is the complete obstruction or collapse of one’s airway during sleep, causing pauses in breathing that can last a few seconds to minutes. During these pauses, oxygen levels can drop dangerously low, putting a person at higher risk of heart attack and stroke. Many people who suffer from OSA are unaware of their condition because they are not conscious to experience physical symptoms like snoring, gasping or partially rousing from deep sleep. Other symptoms of this condition often include insomnia, daytime sleepiness, inability to control high blood pressure and/or blood sugar despite proper medications and frequent awakening throughout the night to urinate or for no apparent reason. OSA is more common in people who are overweight, but it can affect anyone with a large neck or narrow throat. “If someone comes in complaining, ‘I’m still tired no matter how much I sleep,’ apnea is suspected. Many times the person doesn’t realize how many times he or she is waking during the night and not entering deep sleep,” said Bergia. Chronic insomnia is a sleep disorder that causes a person to have difficulty falling or staying asleep three or more nights a week for one month or longer. 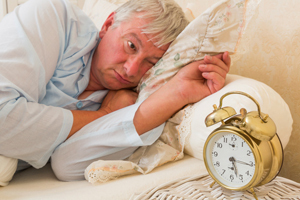 Chronic insomnia can be a symptom of sleep apnea and the two conditions often co-occur. The most common symptom of insomnia is daytime sleepiness or fatigue, which can cause decreased mobility, falls and accidents when driving. This condition can stem from a true lack of sleep issue, an improper or nonexistent sleep schedule. “A person suffering from insomnia is likely to say, ‘I never sleep,’ when in many cases they are sleeping, just not when they are supposed to,” explained Bergia. Crenshaw, who has seven years of experience working within sleep medicine stresses the importance of taking the first step to make an appointment. The assessment process involves an overnight stay at Parkwest’s accredited Sleep Disorders Center in a comfortable bedroom setting. Trained experts use the latest technology to monitor the patient’s sleep patterns, allowing doctors to make a diagnosis and staff to begin educating the patient about the array of treatment options. Gwendolyn Crenshaw, family nurse practitioner (FNP) and educator at Parkwest Sleep Disorders Center, enjoys listening to patients and finding the perfect device or appliance to help them achieve their best sleep. Here, she demonstrates how to properly wear a CPAP device. Reversing insomnia is challenging, but one of the first steps is establishing a proper sleep schedule and practicing good “sleep hygiene.” Sleep specialists work with the patient to formulate a plan based on his or her existing schedule. It usually involves omitting daytime naps and establishing a set time to get up and go to bed each day. More information about sleep hygiene can be found in the highlighted box at the bottom of this page. If a patient’s sleep apnea is mild and occurs only in certain sleeping positions, such as on one’s back, he or she can practice strict “back avoidance” in bed. A patient may also be encouraged to lose weight in order to reduce pressure on the airway. 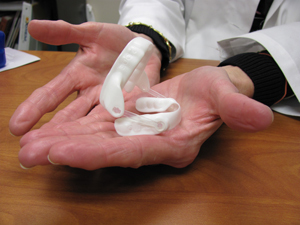 When used correctly, a CPAP (continuous positive airway pressure) device eliminates apnea episodes for the vast majority of patients, resulting in higher quality, safer sleep. For this reason, it’s become the ‘gold standard’ treatment for sleep apnea. Some patients elect to use it long term, while others use it as a short-term solution while they lose weight with the goal of being independent from all sleep-improving devices. Crenshaw and her colleagues work one on one to find customized solutions for patients with sleep problems. They are trained in not only finding the right device, but also in determining the perfect pressure setting for each patient, making the CPAP effective and comfortable. 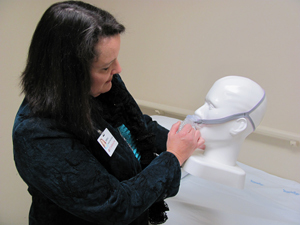 Dr. Berta Bergia holds an oral appliance that opens the airway by gradually moving the lower jaw forward. These options are used by those who are intolerant of or reluctant to try a CPAP device. The oral appliance looks like a top and bottom mouth guard and is specially made by a dentist to fit the patient. It works by gradually bringing the lower jaw forward, preventing the collapse of the throat. The nasal appliance looks like two small bandages with vents that fit over each nostril. Each vent opens fully when the wearer breathes in and partially closes when he or she breathes out, keeping the throat open and the airway clear. While effective, these methods are not always covered by a patent’s insurance. Those patients with a very crowded airway (large tonsils or a narrow throat) may elect to have surgery to remove excess tissue, improving air flow. Regardless of the complexity of the sleep problems, senior patients can rest easy about the care they will receive at Parkwest’s Sleep Disorders Center. Those who have been unsuccessful with other treatments in the past and people with co-occurring disorders or problems that are not easily controlled are encouraged to make an appointment. When asked about what makes Parkwest Sleep Disorders Center effective, Bergia and Crenshaw agree that it’s the supportive team approach and emphasis on communication that reassures patients that they aren’t alone on this journey to experiencing better, safer sleep. For more information or to schedule an appointment, call the Parkwest Sleep Disorders Center at (865) 373-1974 or learn more at our Sleep Disorders Center page.